Here’s a hack with more of a survivalist flair to it. [Ligament] and some friends used the fat from butchering a deer to make soap, candles, and toiletries. It’s hunting season and [Ligament’s] dad is processing the deer which he harvested. Wild game doesn’t have the amount of fat you’d find on a domesticated animal, but there is still a fair amount. The group cut off as much as they could before cutting up the rest of the meat. The trimmings are put in a pot with water and boiled until the fat starts to rise. It is ladled off and strained through some cheese cloth. The fat hardens overnight and can be picked up out of the container as a big disk. It is reheated and strained through a mesh coffee filter to achieve the final product. From there the fat was used as an ingredient in the recipes for candles, soap, and things like lip balm. For details on that heck out the comments for each image in the gallery linked above. It’s a good thing to waste as little as possible. But this skill will be indispensable once the Zombie Apocalypse comes. You might also want to know how to chlorinate your own water. [Texane] picked up a 2.4 GHz transmitter/receiver pair for transmitting sensor data wirelessly. After using them in a project he wanted to try pushing them a bit to see what the limits are when it comes to higher bandwidths. 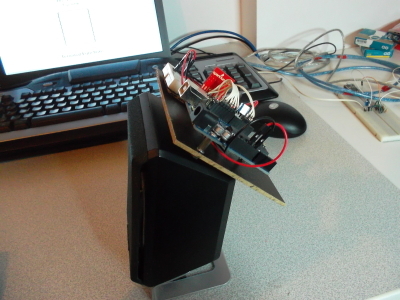 He ended up building a wireless speaker that transmits audio at about 90 KB/s. That link leads to a subfolder of his git repository. The code for this project is in the RX and TX folders, with images and video in the DOC folder. The radio hardware that he’s using is a Nordic nRF24L01P chip which is available on a breakout board from Sparkfun. [Texane] mentioned to us that the chip includes error checking, packet ACK, and automatic retransmission. But these add overhead that can slow things down. The chip does offer the option to disable these features to get lower level access to the hardware. That’s exactly what he did and he mentions that the example code he wrote for the transmitter and receiver make every cycle count. This makes us wonder if it’s the speed of the ATmega328 chip that is the bottleneck, or the transceivers themselves? This quick and easy evaporative cooler might be just the thing the next time the air conditioning goes on the fritz. [Stephen] saw an eBay listing for a personal air conditioner that used a moist sponge and fan to send some cool relief your way. But he wanted to run his own test to see if it really did anything before laying down the cash. The idea is to run air past a moisture source. Some of the heat energy in the air is reduced through evaporation resulting in the exhaust air feeling a bit cooler. It’s the same concept used in swamp coolers (an evaporative type of air conditioning). To build his device [Stephen] grabbed a refrigerator deodorizer which uses a hinged plastic cage to hold a packet of baking soda. He attached a small PC fan to the cage, then inserted a damp sponge. This is so easy to put together you could hit the dollar store on your lunch break and have some relief for the second half of the work day. If you’re looking for a technique that cools just a bit better consider leveraging a beer fridge as a personal cooler.